Tonight the NBA Finals begin. For the fourth straight year, the Cleveland Cavaliers will face off against the Golden State Warriors. If you listen to the pundits, this will be the most uncompetitive, lopsided contest in recent sports history. You’ll see headlines like “Everybody is counting out LeBron James, Cavs in NBA Finals Again” or “Is Warriors-Cavs IV the biggest mismatch in modern Finals history?” You’ll read about how the mighty Warriors, with their entire roster filled with All-Star studs like Steph Curry, Kevin Durant, Klay Thompson and Draymond Green, are going to mop the floor with the poor Cavs, who can offer only LeBron James and a gang of unknowns and retreads. You’ll see statistical analysis of why the Warriors are destined to win, and hear about how the Cavs are in the Finals only because the Eastern Conference of the NBA is like the minor leagues compared to the Western Conference, and see that the Las Vegas oddsmakers have made the Warriors a prohibitive favorite and set a double-digit point spread for the first game. Is this the biggest mismatch in sports — say, since the mighty Miami Hurricanes were supposed to wipe the field with the Ohio State Buckeyes in the National Championship game on January 3, 2013? I guess we’ll just have to see if the know-it-all commentators and talking heads could possibly be wrong, and the Cavs can luck out and scratch out even a single win against the media darlings — which would no doubt happen only with the help of the officials and an overconfident Warriors team that doesn’t bring its “A” game against a feeble opponent. Sometimes, in sports, the underdog does win, and the conventional wisdom proves to be wrong. Will it happen this time? I’ll be watching to find out. But if the impossible does occur, and David does manage to slay Goliath in 2018, it will be one of the sweetest wins in the history of sports. Because this time, it truly is Cleveland against the World. Kyrie Irving wanted to leave the Cleveland Cavaliers, and yesterday he got his wish. The Cavs dealt Irving to the Boston Celtics in exchange for up-and-coming guard Isaiah Thomas, a forward, a center, and a number one draft pick. When a player wants to leave a team, as Irving did, it’s not uncommon for fans of the team being spurned to be mad and call the player an ingrate. I hope Cavs fans are classier than that when it comes to Irving. He’s still young, and he wants a chance to be, in Reggie Jackson’s immortal phrase, “the straw that stirs the drink.” Irving indicated that he wanted to go to a team where he could be the go-to guy and have a chance to really emerge from LeBron James’ colossal shadow. That’s really not so hard to understand for a player of Irving’s obvious skills and talent. I’ve always liked Irving, with his flannel shirt personality and willingness to accept a lesser role in a quest for a championship. Cleveland fans will never forget that it was Irving that hit The Shot that put the Cavs ahead for good in game 7 of last year’s championship series — the one that miraculously produced Cleveland’s first professional sports championship in more than 50 years. How can you dislike a player who is a key part of busting up a lifetime of sports futility? So I say, thank you, Kyrie. Fare you well (except when playing the Cavs). Tonight the Cleveland Cavaliers square off against the Golden State Warriors in the NBA championship finals. It’s the first time in NBA history that two teams have played each other for the championship three years in a row, and the ledger stands at 1-1 — with Golden State winning the first year, when two of the three Cleveland stars were out with injuries, and the Cavaliers memorably winning in seven games last year, as LeBron James, Kyrie Irving, Kevin Love and their teammates brought the first championship trophy to Cleveland since 1964. There are more story lines to this series than you can count. There’s the tiebreaker angle, of course, and the fact that the lineups of the two teams are more studded with NBA All-Stars than any two prior teams that have met in the finals. There’s the fact that Golden State hasn’t lost a game this post-season, going a perfect 12-0, and are pretty much invincible when Steph Curry, Klay Thompson, Draymond Green, and Kevin Durant are on the floor. (Cleveland, on the other hand, has lost only one game in its march to the championship series.) There’s the fact that the gifted Durant joined the Warriors specifically to try to win an NBA championship, and now he gets his chance. And there’s the weird, post-“off the schneid” vibe of a Cleveland team playing for a championship without the weight of 52 years of futility, bad luck, and bad karma hanging on their shoulders. A Cleveland team, playing as defending champions? Who’da thunk it? The overwhelming consensus seems to be that the Warriors will win handily, just as they’ve done in virtually every other game this season. In fact, some people are betting that the Warriors will end this post-season 16-0, which has never been done before. That conventional wisdom is not surprising, because in the last three seasons Golden State has won more regular season games than any team ever has, even though they are playing in the much tougher Western Conference — so they logically should be the favorite. Of course, the same arguments were made last year, when the Warriors were of course without Durant, and the Cavs ended up winning anyway. I don’t pretend to have any great insight into how tonight’s game will go, but I’ll be watching for one thing: can the Cavs keep the game close? The Warriors blow out so many teams, you just wonder how they will react if the game comes down to the wire and they’re thinking their home-court advantage might be on the line. I’ll also be interested in seeing what kind of impact Cleveland’s other key contributors — players like Tristan Thompson, J.R. Smith, Iman Shumpert, Kyle Korver, and Channing Frye — have in this game. If the Cavs hope to win, they need a significant contribution beyond just the James/Irving/Love trio. Two other points: First, the NBA playoffs seem to take forever, and there are long layoffs between series, so let’s hope the two teams are not too rusty. Second, why does the game have to start at 9 p.m. Eastern? I know it’s out on the west coast, but can’t the NBA have a little regard for the working stiffs among us who’ll need to get up tomorrow morning and get off to work? Thirty years ago, yesterday, UJ and I and two of our friends were sitting in our seats in Cleveland Municipal Stadium, watching the AFC championship game and hoping that the Browns would finally make it to the Super Bowl. It was the first year after Kish and I had moved back to Ohio from Washington, D.C., and UJ and I decided to spring for season tickets to the Browns. To our delight, the team — led by Bernie Kosar, Ozzie Newsome, two great running backs, some very good receivers, a defense that would bend but not break, and an indomitable coach, Marty Schottenheimer — turned out to be really good. We saw some great wins during the regular season, and the Browns had won an improbable, come from behind, overtime thriller playoff game against the Jets the week before. Now, on a cold day on the Cleveland lakefront, the Browns were playing the Denver Broncos for the AFC slot in the Super Bowl. Of course, just as the Browns seemed to be on the cusp of victory that day, “The Drive” happened, and the hopes of the team and Browns fans the world over were crushed. It’s a story that has almost become the stuff of legend — which is why you can find Cleveland newspapers and, of course, the Denver Broncos website remembering it, 30 years later — and it is always mentioned, bitterly, when people talk about the horrors of Cleveland sports fans over the past half century. I didn’t realize that yesterday was the 30th anniversary of “The Drive” until one of the guys I went to the game with mentioned it. I groaned when he did, because I had no interest in ever thinking about that game again, and I expected to experience that familiar hot blast of pain and frustration that always bubbles up whenever I remember that game — but to my surprise my reaction yesterday really wasn’t all that bad. It’s almost as if the Cavs’ NBA championship win last year, and the passage of three decades, have taken the pitchforks out of the demons’ hands that are lurking in my Cleveland sports fan subconscious and replaced them with something softer that can produce a twinge of regret, but not the torment and angst that once seemed to be everlasting. They say that time heals all wounds. Maybe it’s true, even for sports fans. Russell, UJ, and I had a blast at Game One of the World Series last night. Downtown Vleveland was packed before the game, and the area between the ballpark and the Cavs’ arena — where the Cavs were to play, and win, their season opener — was especially jammed. 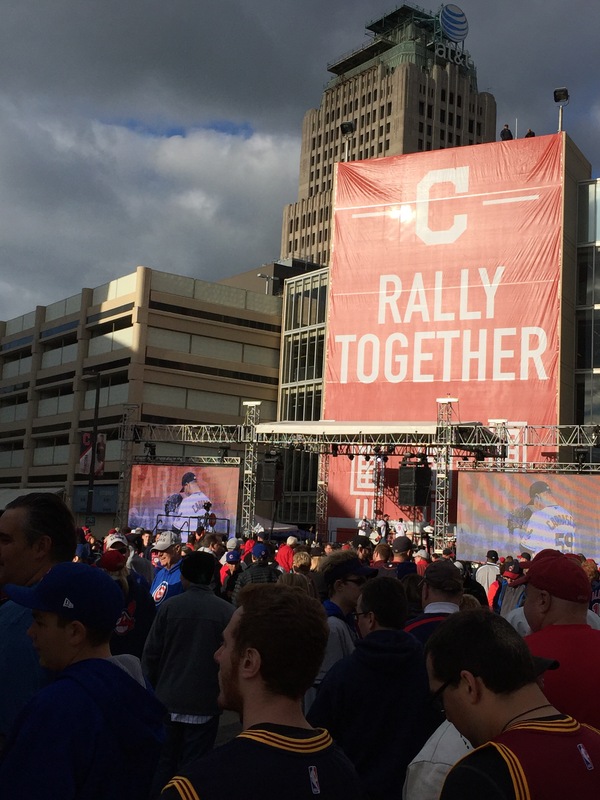 Two big screen TVs were set up to play season highlights and get both the Cavs fans and the Tribe fans fired up. I’m sitting at a computer here in Columbus, Ohio, but my heart is in Cleveland right now. If I were physically in Cleveland, I’d be cheering my brains out, and drinking another beer, and buying a round for the bar, and wanting to stay out forever and talk about the game, and my town, and my teams, so the night would never end. I’d want to think about LeBron James’ clutch block, and Kyrie Irving’s killer shot, and the nails defense that the Cavs played in the last quarter — because those plays had finally pushed The Drive, and The Fumble, and Red Right 88, and the ’97 World Series to the background, where they belong. Bad thoughts have finally — finally! — been exorcised and replaced by happy ones. And these are happy thoughts that we will always have. I’ll never forget it, and I doubt that any true Cleveland sports fan will, either. The people of Cleveland deserve it. They really do. They not only deserved to win, after so many years and so many heart punches, they deserved to win in historic fashion, with the northern Ohio kid who came home, with the first NBA team to come back from a 3-1 deficit to win it, with the impossible three-game winning streak — including two victories on the road — against the best regular-season team ever. No one will ever forget this NBA finals, and it went to the Cleveland Cavaliers. LeBron James will never have to buy a drink in Cleveland, for the rest of his life. When LeBron James fell to his knees and wept after the final buzzer sounded, I knew exactly how he felt. My emotions were so close to the surface, I’m not sure if I was laughing or crying or cheering. All I know is that 52 years of frustration was finally coming out, in whatever way it could. Deep down, I think, I never really thought I would know what it felt like for a Cleveland professional sports team to win a championship.